Burma police fired rubber bullets, tear gas and water cannon at peaceful Karenni protesters opposed to a statue of General Aung San that had been unveiled earlier this month in Loikaw the capital of Kayah State. Organizers of the protest estimated that at least 3,000 people demonstrated on Tuesday against the statue of Aung San in gold, riding a horse – 54 people have been charged this month for unlawful assembly, incitement and defamation. The UN’s special rapporteur on human rights in Burma, Yanghee Lee, condemned the police for its “violent response” to the peaceful protests. 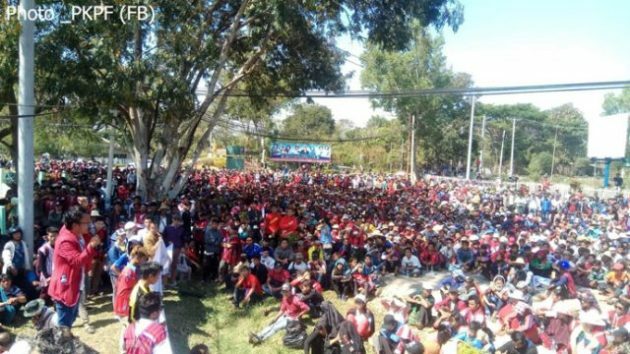 The KWO praised the protesters for having “taken a courageous stand against the placement of General Aung San’s statue in the Karenni capital, Loikaw. The government sponsored newspaper, Global New Light of Myanmar reported on Wednesday that state officials had revoke the charges against the protesters and demonstrators agreed to stop their protests for the moment.